Depending on the state where a business operates, one of the requirements for a new or entirely reconstructed restaurant to open for customers is to have a floor plan, approved by the respective authorities. Restaurant floor planning is a complex process that most business owners have to deal with at some point. Although the whole procedure requires a lot of time and efforts, it should not be considered as just some annoying paperwork. 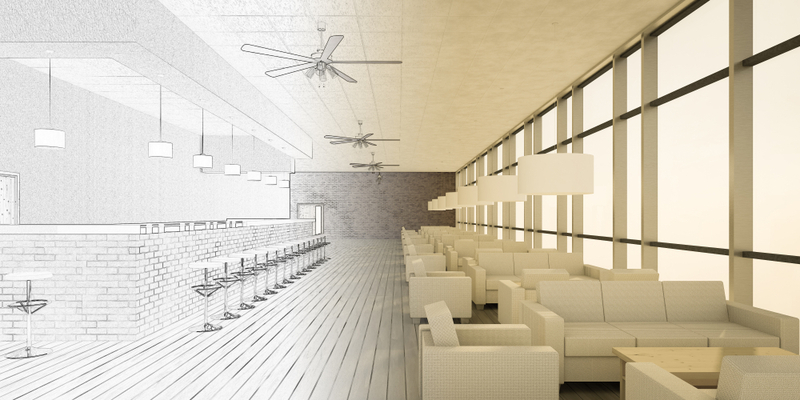 In fact, the way a restaurant floor plan is designed can have a significant impact on its future results. Many business owners tend to underestimate the importance of having a professionally-designed floor plan, just to learn the hard way how valuable it really is. 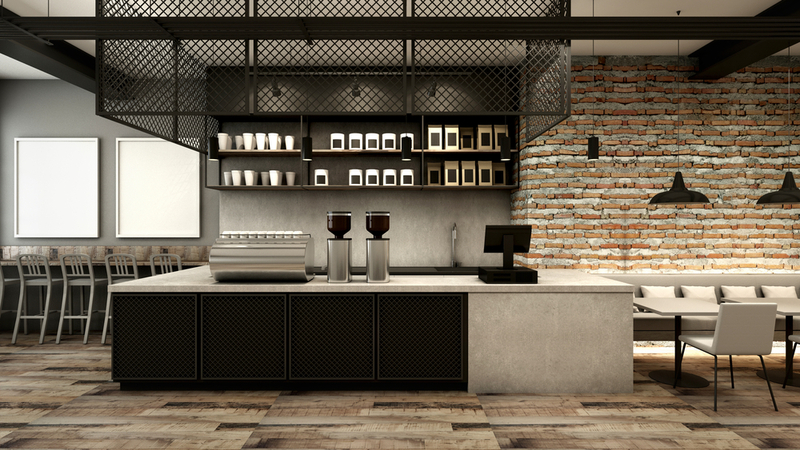 In the following article, we will go through the best practices for professional restaurant floor planning and will provide valuable pieces of advice on how to handle the whole procedure in an efficient and time-saving way. By focusing on software solutions that can help restaurant owners optimize the floorplanning process, we will dive deep into the details on how to arrange the seating and designing the premises in a way that will further increase the performance and efficiency of the whole business. Hint: Don’t start with the construction until you have the floor plan approved by the local authorities. Otherwise, you risk having to make changes or starting from scratch. A restaurant floor plan is a schematic presentation of the way the restaurant interior and exterior will look like. The plan considers the space, the workflow processes, and the tables arrangement. It also outlines the whole brand idea, financial projections, construction considerations, and requirements. Although floor plans depend on the type and size of the restaurant, most of them include pretty similar components. The first thing to include in your restaurant plan is the entrance. Keep in mind that it creates the first impression of your place and shapes the overall feel of your restaurant. It should be tailored to your whole idea by capturing the essence of your restaurant’s uniqueness. Apart from the beautiful design, the entrance area should be constructed in a way to be able to handle the projected traffic. The last thing you want is to leave people waiting in queues. That is why you should consider spending enough time to design the waiter zone as well. Both of these areas serve as the face of your restaurant. Designing them in an aesthetic and comfortable way will ease the waiting process for your customers. This will further decrease the risk of losing clients due to long waiting times. This is one of the most critical components of your restaurant. When designing the floor plan, make sure to place the bar in a communicative place which will ensure that your waiters can reach it easily and in a matter of seconds. A good and proven idea is to place the bar in front of the kitchen. That way you will save space and make sure to ease the process of order delivery. Apart from the organizational pros, connecting the bar with the kitchen allows you also to optimize the plumbing and electricity network by connecting them in one, joint unit. Think of the bar as a point of reference. Build your floor plan around it. This is the point where most of the processes start and orders are processed. Place it centrally to ease your staff and further decrease the waiting time for your customers. The bar is also considered as the best place to install your POS system. That way, your main infrastructure will be easily accessible by all staff and will significantly increase the efficiency of each and every process – from order placement, through its processing, right to the payment. When designing your bar area, make sure to create a cosy and appealing atmosphere. Take into account the fact that people will often sit there and order drinks. They will need to feel comfortable enough when sitting or standing. Consider the bar as a place for communication. Clients and staff will be roaming around and engaging with each other. This means the bar should be as functional as possible. Undoubtedly, the dining room is the most important area of your restaurant. The way it is designed and assembled often makes it the “make it or break it” point for business owners. One of the most important characteristics that you should seek to instil in the dining room of your restaurant is cosiness. This zone should be inviting, while at the same time a little bit of intimate, but not at the expense of space. Ultimately, a dining area should take approximately 60% of the whole restaurant. Hint: In order to calculate the exact space that you need for your dining room, plan on approximately 15 sq. ft. per customer, including corridors, entrance and pickup stations. If you want to maximize the experience of your visitors, you can increase that figure to 20 sq. Another thing to consider is the way the seating will be organized. Bear in mind that the most important thing for your customers is to feel comfortable. According to a very popular study (Robson, 1999), the environment of a restaurant significantly influences people’s behavior. In the study, Robson introduces some ambient factors such as the color of the walls, lighting, sound and overall atmosphere of the restaurant, as well as some design factors, such as exterior features, restaurant layouts, furnishing, etc. which greatly affect the table turnover rates. 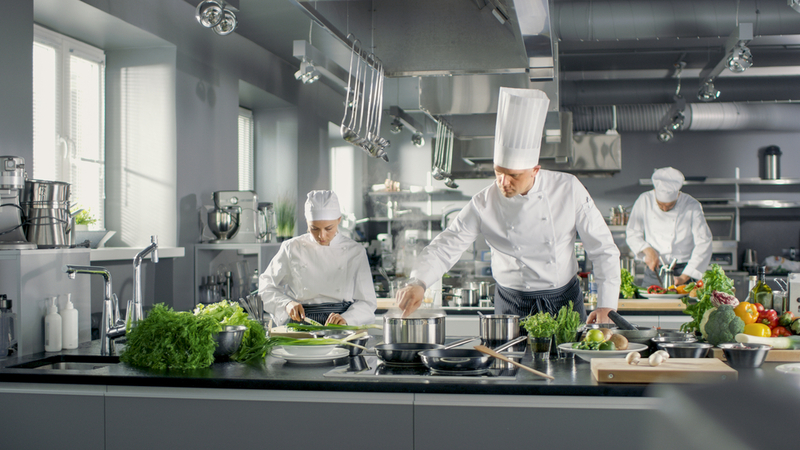 Next comes the kitchen – an area that is more important for your inner processes and the operational organization of your restaurant, rather than the customer’s experience. Having a well-designed kitchen will increase the efficiency of your staff and keep them satisfied in the long term. Usually, designing the inner layout of a restaurant’s kitchen is always a pretty challenging task due to the fact that there are numerous objects and systems that should be fit inside, such as inventory, preparation areas, dry store, food storage zones, dishes, cooking systems, changing room, supplies and goods receiving zone, etc. This type of kitchen provides 3 separate areas for food processing. The idea behind it is to move the food through a set of different stations – from the preparation of the raw food, through cooking, right to plating. This type of kitchen layout requires less movement from the staff and more movement of the food. It is suitable for restaurants that prepare a few dishes but in large quantities. The island design separates the different operations in various spots around the premise and more specifically – on the perimeter of the kitchen. The ovens and the grills are placed in the centre which requires some movement from the kitchen staff, once the food is ready to be cooked. This type of kitchen layout is focused on placing the different stations next to each other, in specific zones around the premise. This allows the cooks to pass the food quickly according to the next process on the list. The zone-type kitchen layout allows more free movement of the staff and is very flexible, which means it can be easily transformed according to the specific design and size considerations of the restaurant. When choosing where to place the restroom, note that these areas should be separated from the dining room, but at the same time – remain easily accessible. Although this may sound confusing, think about all the restaurants that you have visited and how well (most of the time), their restroom plan is designed. In order to achieve the same, make sure to think over where to place your restroom just after you have decided on the exact place of the kitchen area. Placing the restrooms near the kitchen is a good idea, considering the fact that you will be able to use the same plumbing and will save you some costs. Apart from that, in most cases, kitchens are separated from the dining room, which fits the bill as well. If you decide on placing the restroom near the kitchen, it will be both – easily constructed and accessible by your customers. The most important thing when choosing the place for your restaurant’s restrooms is to comply with the Americans with Disabilities Act. Or in other words – to make it easy for the disabled part of your visitors to reach the restrooms, without having to manoeuvre all the way across your restaurant. The outdoor area of your restaurant should not be considered as just a secondary zone that has some tables aligned. The exterior of your place is the one that attracts those customers that are passing by or are not aware of the quality of your restaurant. That is why, the way you align the tables outside your restaurant, as well as the green areas and the overall design of the zone is so important. It should be visually appealing and aesthetically pleasing. The crowd passing by should be tempted to get in and try the items within your menu. That is why you should not aim to place as many tables as possible within a small area. Make it look comfortable and spacious. And on top of that – add that sense of “freshness” by ensuring there are some green areas around the tables. Nobody loves restaurants that are placed in high-traffic areas or near busy streets. If this is the case with yours, do all you can to minimize the effect of it. When designing the outdoor area, do not think only about the comfort of your customers. Think about the comfort of your waiters as well. With that said, make sure to place the patio within the shortest path, so that your staff does not have to walk much before reaching the tables. That way, you will increase their efficiency and ensure that the food will be served as soon as it leaves the kitchen. A study by S. Robson and the Cornell University School of Hotel Administration suggests that, in order to ensure fast service, each restaurant should aim to have a serving area no farther than 25 feet from any table. This area should be present in each and every restaurant. Do not forget the fact that your staff is your most precious asset that defines whether your restaurant will be successful or not. That is why, when designing the staff room, focus on making it as comfortable and as spacious as possible. Although it won’t be full of people most of the time, it is always better to make them feel good when having a rest. This is also the place where you can hang on some announcements or etc., although it is always better to do that and arrange your employees’ shifts through a restaurant management system. 8. How to design a floor plan? There are two main ways to handle the floor planning process – the first one is to hire a professional designer/architect and the second is to do it yourself with the help of a specialized software. While the first one is often considered as the safer and easier option, many restaurant owners decide to handle the process on their own. This multi-purpose software allows you to design the floor plan and the interior of your restaurant both from a desktop and a mobile device. It is user-friendly and highly functional, which makes it a suitable choice if you want to bring your creative ideas to life easily and professionally. The big plus here is that, if you find the task pretty challenging, you can get in touch with the RoomSketcher specialists and order them to handle the floor plan design for you. The software has a free version that has its limitations and also two paid options ($49 and $99 per year) that allow you to design in 2D and 3D. The paid versions also provide access to 360 views, 3D photos, interactive 3D floor planning and other useful functionalities. This program is more of a “diagramming app”. It is simple and easy to navigate, yet functional enough to satisfy your design needs. In order for you to create a floor plan, you should, first of all, choose a template and then build upon it. SmartDraw allows you to use flowcharts, which is a very useful solution if you want to map some of the processes within your restaurant. For the more advanced restaurant owners, there is the option to design and integrate infographics, network maps, marketing charts, maps, etc. The cost of this software is $119.40 per year (or $9.99 per month). ConceptDraw is a good choice for those who want to get things done easily and as soon as possible. The software has an integrated “Café and Restaurant Plan” module, that provides you with a head-start in the process of designing your premises and tables layout. 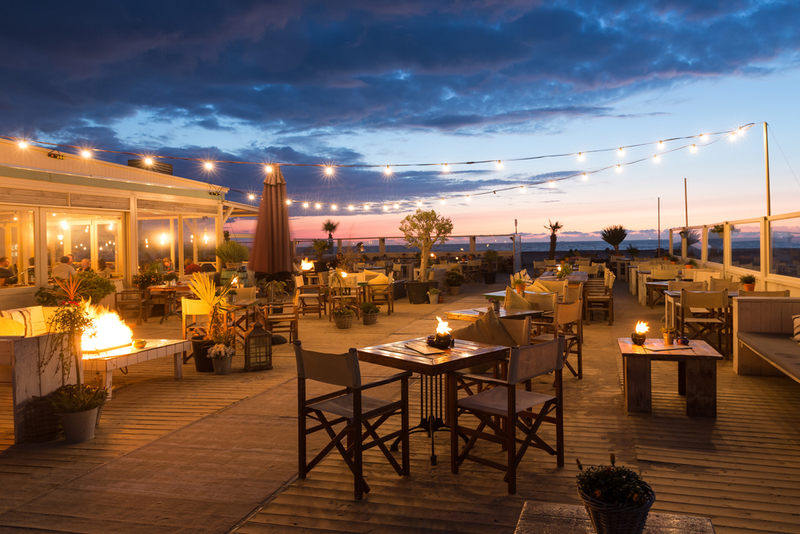 It has lots of examples and you can choose plan suggestions depending on the type of the restaurant that you are about to open – be it an Italian one, a nightclub or a coffee/gelateria. ConceptDraw is a little bit pricier than the other options, starting from $199 with an additional $25 for the “Café and Restaurant Plan” solution. As one of the most intuitive and functional planning software, FloorPlanner allows you to create an interactive design easily and with lots of options to choose from. If you are stuck and need some assistance, you can set the planner to “hospitality” mode and it will list you all the areas that you need to include in your restaurant plan. You can then easily arrange the bar, kitchen, restrooms, dining room and everything you want within the restaurant layout. The cost of the software depends on the number of plans that you would like to be able to create, ranging from a free version to paid ones of up to $29 per month. One of the most popular and widely-used programs for floor planning that allows you to experiment with the table layout, seating charts, menus design, flyer creation, catering and facility plans, etc. CadPro provides you with access to various sample plans that can serve you as useful examples and help you get started easily. According to the software’s website, the program is currently used by more than 2.5 million people worldwide. If you want to become one of them, you should set aside $99 in order to download it. No, you are not ready to start with the construction or renovation work, yet. After you are done with the planning process, you should then submit the floor plan to the respective authorities. Note that you may need to wait up to 8 weeks to get your approval. And if the authorities find some components of your plan that may need revision, you may be forced to get back to the planning board. But once you get your approval, you may start with the construction work. Stick to the plan and do not add anything that is not listed there already. The most important thing here is to build/remodel your place in accordance with all local requirements and structural codes. After you finish the construction work, your restaurant should be examined by the authorities in order to verify that everything is delivered according to the initial floor plan and all building codes are met. Then you are ready to move forward. Restaurant floor planning is a very important step in the process of opening your restaurant. It requires significant patience and should be handled with extreme attention to detail. The planning process is critically important, due to the fact that you should take into consideration all future processes and their optimization. Make sure to spend enough time doing your research and brainstorming design and layout ideas, as they are crucial for the projected performance and profitability of your future restaurant.